The Ukrainians are in charge of the disposal of radioactive waste. Speaking about the Japanese, they have extensive experience of liquidating the consequences of such accidents. They encountered similar problems after the Fukushima Daichi nuclear catastrophe that had happened in 2011. It was caused by the earthquake and the following tsunami. Onishi, who worked as a consultant at both plants, noted that there were significant differences between the two accidents. The Japanese started to take away the radioactive substances at once after the event so that they did not get into the environment. And as for the accident in Ukraine, such steps were not taken. At this point in time the damaged reactor is placed under a new sarcophagus, so the next stage is to remove the temporary shelter constructed after the explosion. It is to be disassembled till 2023. 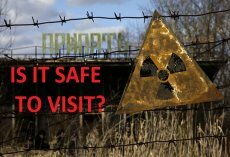 It is planned that its remains will be transported to the nuclear waste repository sites in the neighboring village Buryakivka. It will prevent the old shelter from collapsing and will clear the space for further activities, i.e. removing the nuclear fuel. Sergiy Paskevych, a radioecologist working in the safety department at the ChNPP, explains that the cranes that are being erected inside the new sarcophagus will be operated remotely and will be used as cutting tools in order to dismantle the old steel shelter. He says that the machine will resemble a huge robot: it will be controlled by an operator working at a safe remove. So it will disassemble the dangerous radioactive building without compromising the workers` health and safety. It is also planned that at the same time a special tool will be extracting the radioactive dust. At this stage Ukrainian experts have worked out a scheme for dismantling one steel construction only. Sergiy Paskevych notes that the process of disassembling will be started at once after the construction of the new sarcophagus is finished. Speaking about the level of radiation in the zone, it is still high enough. According to the results of measurements, it ranges from 500 to 1,000 micro-roentgens per hour, while it is considered that the safe level is 30 micro-roentgens per hour. That means that scientists will have to take a number of steps to ensure that workers involved in the process of disposal are safe. Onishi adds that at the moment multiple reactors located in the US, Japan and some of the European countries are being dismantled. And in each case scientists are facing different kinds of problems. However, if they cooperate, they will have the opportunity to share their unique experience and to help each other overcome difficulties. Used nuclear fuel is very hot and radioactive. Handling and storing it safely can be done as long as it is cooled and plant workers are shielded from the radiation it produces by a dense material like concrete or steel, or by a few metres of water.Water can conveniently provide both cooling and shielding, so a typical reactor will have its fuel removed underwater and transferred to a storage pool. After about five years it can be transferred into dry ventilated concrete containers, but otherwise it can safely remain in the pool indefinitely - usually for up to 50 years. Currently, the majority of used fuel is not recycled, But reprocessing used fuel to recover uranium and plutonium avoids the wastage of a valuable resource. Most of the used fuel - about 96% - is uranium, and up to 1% is plutonium, with the remaining 3% being high-level waste. Both reprocessed uranium and plutonium have been recycled into new fuel. Plutonium mixed with uranium in their oxide forms is known as mixed oxide fuel (MOX).The high-level wastes (whether as used fuel after 50 years cooling, or the separated 3% of reprocessed fuel) will be disposed of deep underground in geological repositories. Intermediate- and low-level wastes are disposed of closer to the surface, in many established repositories. Low-level waste disposal sites are purpose built, but are not much different from normal municipal waste sites.Nuclear power is not the only industry that creates radioactive wastes. Other industries include medicine, particle and space research, oil and gas, and mining - to name just a few. Some of these materials are not produced inside a reactor, but rather are concentrated forms of naturally occurring radioactive material. Civil nuclear wastes from nuclear power plants have never caused any harm, nor posed an environmental hazard, in over 50 years of the nuclear power industry. Their management and eventual disposal is straightforward.